LASIK surgery technology has evolved to new levels of precision, accuracy, and performance undreamed of even a few years ago. Laser vision correction and LASIK has seen steadily increasing improvements in the safety and precision in LASIK. The Orange County Eye Care and LASIK Center is committed in providing you with your best vision. That is why we are proud to offer the most advanced LASIK options with Custom LASIK and bladeless Intralase LASIK. This page will detain the state of the art technology that allows our Orange County LASIK Surgery center to obtain 20/20 or better vision in over 99% of our patients. The first step in LASIK surgery is to create a corneal flap. Historically, the corneal flap has been made by a mechanical oscillating razor blade called the microkeratome. While complications in LASIK are rare, they are usually related to the flap making process. With the approval of the all laser Intralase LASIK laser, the safety of the flap creation process has never been better. 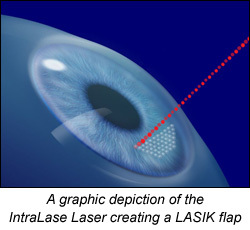 How does the Intralase laser create a LASIK flap at the Orange County LASIK Institute? The Intralase laser is a high frequency laser called a femtosecond laser. It uses high pulsed light energy to create a layer of microscopic gas bubbles at a precise level as determined by your Orange County LASIK Center surgeon. The improved safety of the flap making process is due to the laser light passing harmlessly through your cornea to create a level of bubbles. Thousands of these tiny bubbles are stacked together to create a flap. The whole process only takes 20 seconds to create your flap! The Intralase laser is a quiet laser and there is only a mild pressure sensation as the flap is created. After the flap is made (only 20 seconds), your LASIK flap is gently lifted by your Orange County LASIK Center surgeon. Dr. Pham will then use a second advanced laser to complete your LASIK treatment. After your LASIK flap is completed, you are nearly half way towards completing your LASIK procedure! Increased safety and precision in the LASIK flap making process. Allows your LASIK surgeon to precisely determine the size and depth of your flap. More patients see 20/20 or better with the Intralase method. Faster recovery times after LASIK. Increased candidacy for LASIK patients. Many patients who may have not been LASIK candidates with the razor blade (microkeratome) may be candidates with the Intralase method. After the corneal flap is made with the bladeless Intralase laser, the VISX Star S4 Laser system is used to create a custom LASIK treatment for your eye at our Orange County LASIK center. The Orange County Eye and LASIK Center's custom technology uses a "wavefront" to make a unique map of your eye. This map is then used to create a 100% unique treatment for your eye. Many laser systems used in LASIK offer an "wavefront optimized" treatment. However, only the VISX S4 with Advanced Custom treatment used at the Orange County Eye and LASIK center offers true wavefront treatments. Custom LASIK technology used at the Orange County LASIK center is the same technology that is used to treat fighter pilots and NASA astronauts. We are proud to offer CustomVue Lasik surgery for our Orange County, Irvine, Newport Beach, and Huntington Beach patients. Step 1 of Custom LASIK: The laser takes an individualized wavefront map of your eye. This is 25 times more accurate than standard measurements for glasses or contacts. 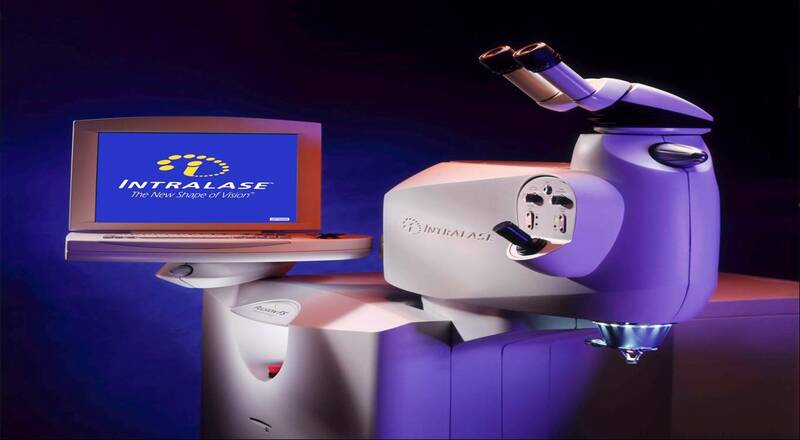 Step 2 of Custom LASIK: The laser creates your treatment plan by matching your wavefront to a perfect optical system. Step 3 of Custom LASIK: The VISX laser then delivers a unique treatment with unsurpassed precision. Iris registration is the only Advanced Custom LASIK platform that is FDA approved. Your iris is "captured" by using infrared imaging. Every iris has unique markings that the laser can capture. 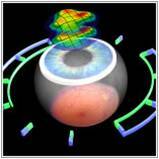 The iris is then used to align your treatment correctly at the time of your Orange County LASIK technology. Previously, Orange County and Hungtington Beach LASIK surgeons used a marking pen to make sure that they treatment was aligned. Iris registration is a higher level of LASIK technology that allows us to accurately align your LASIK treatment. The VISX S4 Excimer LASIK laser is the only laser with FDA approved iris registration.